Let’s show everyone why they want Freedom Soaps in their home and why they want to give it as a gift through a library of custom images. Anne and Vince Schilleci purchased Freedom Soap Company in 2017, and they have big plans for these all natural products. They came to us to help them grow their brand and take it to the next level, so naturally, we started this process by understanding their ultimate goals and updating their product photography. Branding photography created for Freedom Soaps to showcase their all natural soap and cleansing products. This image was used for their website hero image created by Zeekee, a Bell Media Company. 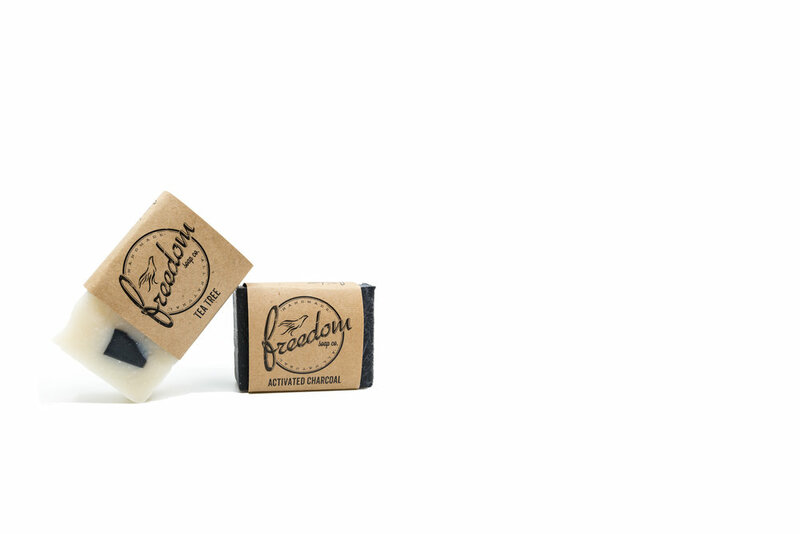 Product photography created for Freedom Soap Company featuring their all natural Tea Tree and Activated Charcoal soaps. The first place we started to update the image of Freedom Soap Co. was their product photography and creating a great hero image for their new website. It was important that the hero image emulate what they are doing as a company and that the product photos showcase the products in a professional manner. The next step to creating a cohesive marketing strategy was to start cultivating a library of custom images to tell the Freedom Soap story. These Birmingham, Alabama makers are passionate about caring for our environment and providing a product that people will love. Through a series of monthly photoshoots, we are able to help them do this in a beautiful way that will enhance their brand image. This month we focused on the Fall and created a set of styled imagery for them to use this season as well as in following years. Since they also sell direct to consumer, we wanted to create lifestyle imagery that will naturally be a beautiful part of their target audience’s Instagram feed. Follow along at @freedomsoaps on social media to see the custom imagery we continue to create for them. Are you ready for us to help you create your own custom library of images and video to use in your print and digital marketing efforts? Freedom Soap Company is a family owned, small batch, all natural soap and skin-care company based in Birmingham, Alabama. Their passion is creating all-natural, luxurious products that are good for you and good for our environment. To learn more, visit www.freedomsoaps.com. Older PostTours make the experience much more real and personal for users.